In the wee hours of the morning on October 25, 1886, a train pulled into the station at Pensacola, Florida. By 8:30 a.m., people were lined up to view the occupants in the highly publicized event. Onboard was the most notorious Indian ever captured by the United States Army. 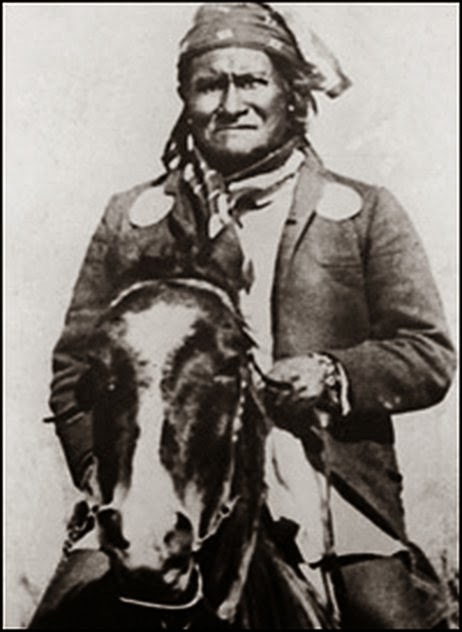 Geronimo, along with 14 other Apache warriors, had arrived. Thirty soldiers stood guard over the Indians while townspeople pointed and gawked at the sight of the natives they’d read about, especially Geronimo. He’d made a laughing stock out of the US Army, avoiding capture many times, then escaping when captured. Newspaper cartoons caricatured the events happening out West which made the elusive Geronimo appear to be the victor instead of the captured. Meanwhile, the 62-year-old Apache with the shiny black hair, parted down the middle with a handkerchief tied around it, sat resolute, observing those who came to see him. He had finally surrendered, accepting the conditions of a handshake that guaranteed him his own land. But he and his band of warriors were sent to prison instead. Because the Army didn’t want to risk another embarrassing escape, he was sent to Fort Sam Houston in Texas, then to Florida. 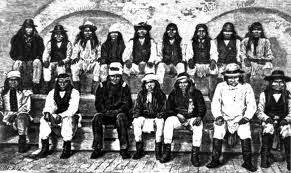 The Apaches were sent to Florida as scheduled, however, the families were divided. When the train stopped in Pensacola, the men were removed, but their wives and children in a separate rail car continued on to St. Augustine and Fort Marion. The men were then taken to the wharf to a steamer where they were ushered aboard for the ride across the bay to the island where Fort Pickens awaited. For most of them, their first boat ride was a frightening experience, while one “old” Indian was reported to enjoy the sight of porpoises running alongside. 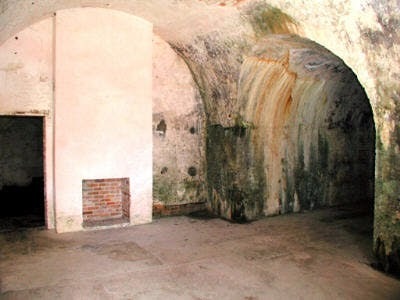 At Fort Pickens the Indians lived in two open casemates with fireplaces. They slept on cots and hung netting in their quarters as protection from the mosquitoes. They were issued army rations, cooking utensils, and clothing. At Fort Sam Houston, Geronimo spent his time playing cards with the others in his band. Things were different, though, at Fort Pickens, where the captives were forced to work each day cleaning up the old fort, clearing weeds, planting grass and stacking cannonballs. Model prisoners, they hoped their willingness to cooperate would reunite them with their families. To see the Apaches, tourists had to first obtain a pass from Colonel Langdon, who was in charge, and pay for a boat trip to the island. Groups of visitors, sometimes as many as 400 a day, took an excursion boat across the bay to see the captives. 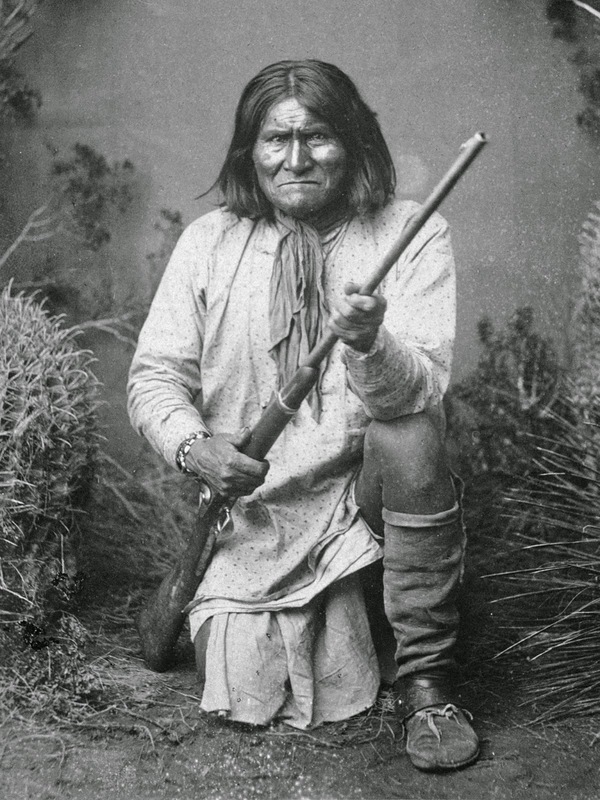 Geronimo, the “savage” whose reputation struck fear in the hearts of Western settlers, enjoyed his popularity and used it to his advantage, requesting various items from sympathetic tourists. Besides entertaining visitors, Geronimo and some of the other Apaches were sometimes displayed in town, where they charged 25 cents for their pictures and autographs. Public outcry over the treatment of the Indians pressured Colonel Langdon to petition his superiors for reunification with their families. As a result, on April 27, 1887, the families arrived and were housed in the officers’ quarters on the south side of the fort while single men were moved to similar rooms on the north side. Soon the sound of women and children was heard at the fort and newspapers reported “Geronimo Happy.” In June 1887, a corn dance was held in celebration of the families’ reunion. About 300 Pensacolians attended by invitation from the Colonel. Unlike at Fort Marion where many Apache prisoners died, the Apaches’ health was generally good at Fort Pickens. 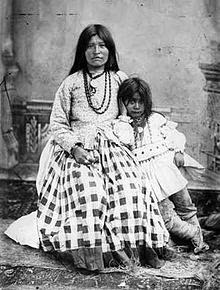 There was only one death during the eighteen months they were held there - She-gha, one of Geronimo’s three wives. She was buried at Barrancas National Cemetery. The fear of yellow fever led the Army to remove the Apaches from Fort Pickens to Mount Vernon Barracks, north of Mobile, Alabama on May 12, 1888. The Apaches were moved a final time to a reservation of 50,000 acres at Fort Sill, Oklahoma in 1894. Geronimo died there in 1909, having attained fame, but never regaining his freedom or returning to his homeland. The remaining Apaches from his tribe were freed in 1913. Marilyn, Thank you so much for the most interesting post about Geronimo. To be uprooted from their homes and moved about over the course of their lives......I know it must have been so hard. Melanie, Can you imagine being put on a train, then a boat - neither of which you've ever been on - and taken to a strange environment? The Florida coast is quite different from the plains in the West! Hi Marilyn, thank you for an interesting post. I didn't really know what happened to Geronimo after his capture. It surprised me to learn that even in the nineteenth century some people were concerned about the treatment of Indians. and demanded the reunion of families. Yes, Margaret, there were people who cared about the humane treatment of others. However, they weren't the ones who lived in fear of Indian attack. And if you read Geronimo's story, he was reacting to a brutal attack on his own family by raiding Mexicans while he was away on a hunting party, and this eventually led to his attacks on white settlers as well. Sharon, thanks for your comments. Wow, what an enlightening post, Marilyn! I didn't know really know much about Geronimo before. So sad, much of the story is...especially how he was promised land of his own but then the promise broken, as it was so often. How interesting that the Apaches were brought to Florida--do you know just where they came from originally? Kiersti, I believe he lived in what we call New Mexico now, hence his problem with the Mexicans in his territory.